In 2008, LEAP launched the Compass Project in three institutions in three states: California State University System, Oregon University System, and University of Wisconsin System–the aim being “to build capacity to support academic excellence for all students, emphasizing the success of students traditionally underrepresented in higher education” (AAC&U). This “re-mapping” of general education was welcomed by the three California state systems (University of California, California State University, California Community Colleges)–the logic being that “Incorporating high-impact practices into lower division GE, the curriculum shared by all students early in the degree and regardless of major, could reduce gaps in performance and completion while improving educational quality for all students” (California Compass blog); students would benefit if the the general education curriculum in these three CA State systems would be strengthened and shared. The Compass Project began to provide small grants for faculty-driven pilot projects looking to explore ways to identify and incorporate high impact practices. During Phase II (2011-2014), California Give Students a Compass supported up to nine pilot sites across the state, all of them aiming to test new approaches to general education and transfer: “Pilot projects seek ways to embed a greater number of high-impact and best practices into the GE transfer curriculum, improving student success in ways that are feasible, scalable and educationally effective” (Phase II website). All pilot projects involved a California State University campus and a nearby community college. In 2012, in collaboration with Dr. Debra David, the Give Students a Compass Project Director based at the CA State University Chancellor’s Office, Dr. Cynthia Reiss, Chair of the WVC Global Citizenship Committee, applied for and was awarded a grant from San José State University’s Phase II California Give Students a Compass Project. That was the beginning of West Valley College’s involvement in the project, and the birth of the Compass Faculty Learning Community that ended successfully in May 2014. Dr. Reiss became the lead faculty of the Compass Project at WVC, and Dr. Dulce María Gray, who teaches English and Women’s Studies at WVC, served as Coordinator of the faculty learning community. The first cohort of faculty members, convened in the fall semester of 2012, also included Andy Kindon who teaches Anthropology at WVC, Eileen O’Halloran who teaches Geography at SJSU and DeAnza College, and Alexandria White who teaches English at SJSU and various community colleges. In the three subsequent semesters, as teaching and life demands permitted, colleagues dropped out or joined the group: Dr. Kathryn Davis, the Director of Global Studies and Associate Professor of Geography at SJSU, Dr. Kathryn Maurer who teaches Anthropology and Foothill College, Dr. John Fox who teaches Sociology at Foothill College, Dr. Mary Conroy Chair of Psychology Department at San José City College, and Dr. Avantika Rohatgi who teaches English at SJSU. Dr. Reiss and Dr. Stephen Branz, Associate Dean of Curriculum and Director of General Education at SJSU, and a participant in the Compass Project at SJSU, usually attended the meetings. 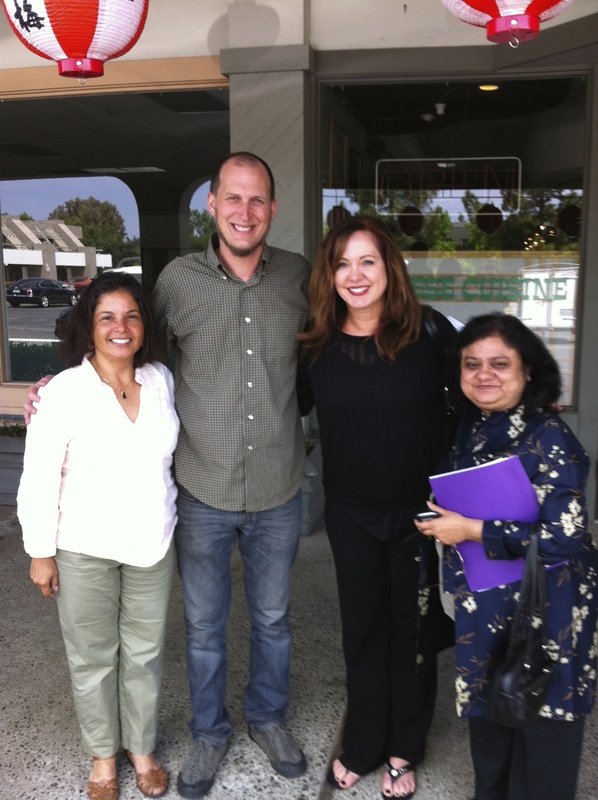 Some members of the CLC during fall 2013 semester, from left to right: Dr. Dulce Maria Gray (teaches English and Women’s Studies at WVC), Dr. Andrew Kindon (teaches Anthropology at WVC), Eileen O’Halloran (teaches Geography at SJSU), Dr. Avantika Rohatgi (teaches English at SJSU). The Compass Faculty Learning Community focused on developing the members’ knowledge about Global Citizenship-based high impact practices. 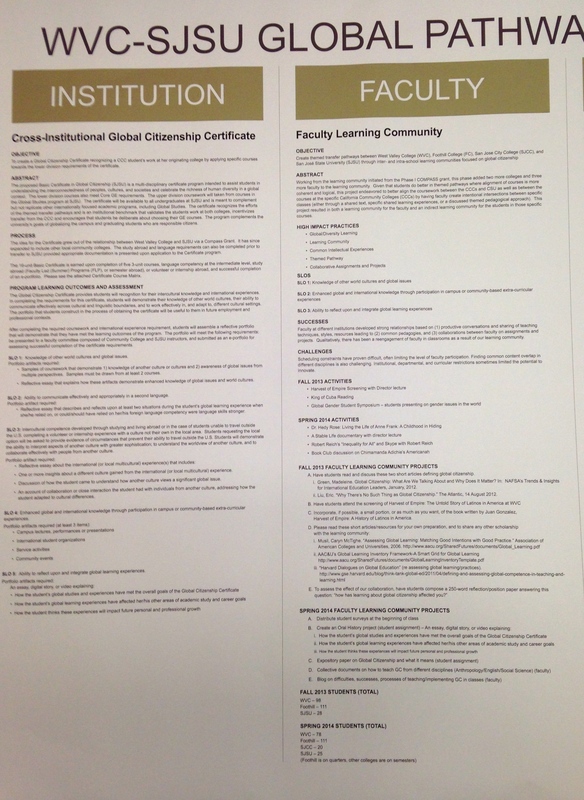 The LC established a general aim for the project: “Fostering integrative learning and developing intercultural knowledge competence, and thereby attempting to improve our students’ retention and success rates (especially our Latino and African American students), by infusing high impact practices that are rooted in the precepts of Global Citizenship/Studies into the courses we are teaching.” During the first year (two semesters), the group focused on learning about Global Citizenship-based high-impact practices, and on building successful learning communities–so that each member could adapt those two high-impact practices to the specific needs of his/her discipline and apply them to his/her teaching. Communicate integrative understanding in ways that enhance the presentation of the connections between/among information from different domains of knowledge. During the second year (two semesters), the group focused more intently on learning and practicing how to apply Global Citizenship-based high-impact practices in each of the disciplines represented in the group. Dr. Reiss took on the charge of analyzing data collected (through surveys administered to each class being taught by the LC members, students’ written reflections, and through beginning and end of semester comparative statistical data) in order to determine if and how the faculty’s learning and purposeful infusion of Global Citizenship-based high-impact practices affected the retention and success rates of their students (particularly their Latin@ and African American students). Involving students in shared intellectual curricular and co-curricular experiences. Those reactions served as catalysts for deep discussion about defining and enacting global citizenship, about critical reading of a text like Dreaming in Cuban and analyzing how it might relate to Anthropology, Geography or any other discipline being studied; these texts served as starting points for completing more specific assignments in the classes. Consequently, each faculty member of the LC said, it was easier to engage students, and when students are engaged, they tend to stay and succeed in the class. Statistical analyses at the end of the first year, and the second year, indicated that retention rates for Latin@ and African American students increased slightly, but the success rate was not significantly better when compared with classes taught without deliberate incorporation of high-impact practices. Such results, though, are not definitive, since the cohort size of the project was small, and additional data collection and analysis was needed to determine a more accurate consequence. The Compass Faculty Learning Community had one definitely productive outcome: it served as a catalyst for closer institutional collaboration between SJSU and WVC. Dr. Reiss, in particular, took on the task of working with colleagues at SJSU and of developing a Global Citizenship certificate, awarded by the SJSU Global Studies Program, which allows students to complete the first two required courses at WVC, and to transfer to SJSU where they can finish the certificate. That endeavor led to the strengthening of the Global Studies Area of Emphasis at WVC, and to the alignment of Global Studies curriculum between the two institutions. 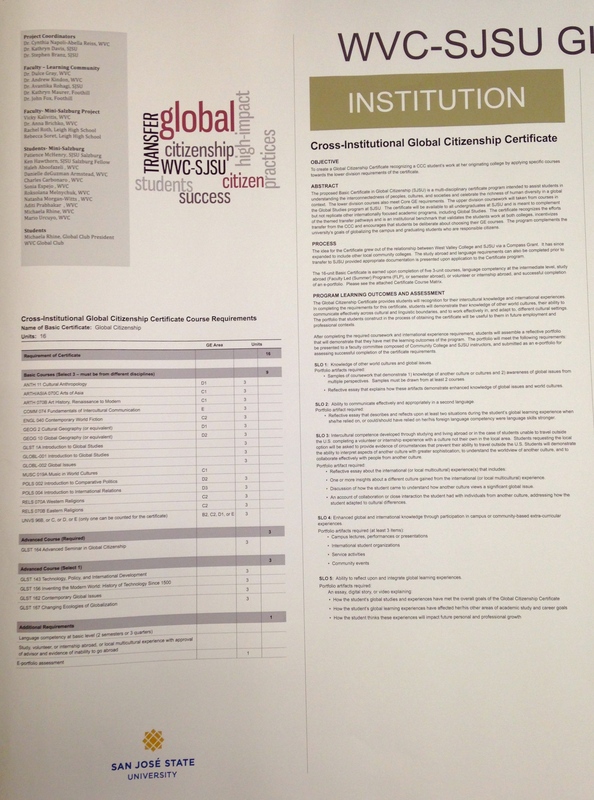 Further information may be found in the description of the cross-institutional Global Citizenship Certificate, and the summary of presentations made at the CSU Symposium on University Teaching and the third annual WVC Global Citizenship Conference.